Description: The Precious Places® Wishing well is a delightful addition to your Precious Places® village. The yellow base is round and it has a wishing well in the center. The base is slightly raised on pegs to allow the Precious Places® magnetic key to slide under the base to move the accessory figure around. The figure, Michele, has a magnet on the bottom that follows the magnet in the key when the key moves under the floor, this makes the figure appear to "come alive" and move by itself. Designed for children ages 5 years and older. FPT6741 - Round yellow base with a hole in the center for the wishing well. There is a litho walkway around the circle with pink hearts, yellow dots, and blue triangles on a purple background. The base has a little entrance area with a slit on each side for the accessory latice-simulated arbor. The opposite side of the base has several little holes for the accessory fence. FPT6742 - Light blue wishing well with a hook in the middle for the accessory water bucket and a hook on the side for the accessory ladle. 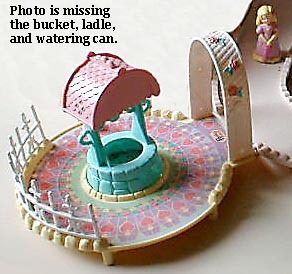 The wishing well has a pink scalloped roof. The roof may be removable. FPT6614 - White soft plastic latice-simulated archway that attaches to 2 holes in the patio. The archway has pink flowers and green leaves on it. FPT6617 - White soft plastic ornamental railings/fence that fits into holes along the side of the base. FPT6743 - Pink watering bucket with a hinged (removable) handle. FPT6744 - Pink watering bucket handle. FPT6745 - Pink ladle with a curved handle that fits on a hook on the side of the well. FPT6746 - Purple garden watering picture with a handle and a round white pour spout. FPT6748 - Precious places figure - Female (Michelle) wearing a pink dress with yellow trim along the bottom and a yellow flower in the center of her chest. She wears yellow gloves, has blonde hair and has a pink flower in her hair. She is holding a dark pink umbrella (folded up, pointing down across her dress). FPT6747 - Light blue key with a magnet on one end and a handle on the other end. The handle is marked "Precious Places®" on one side and has a litho on the other side. FPT6749 - Sold in a 8" long, 10" high, 2-1/2" deep box.